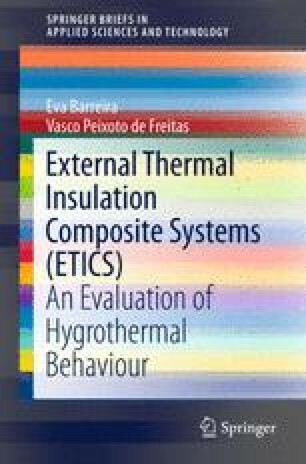 External Thermal Insulation Composite Systems—ETICS, have often been used in Europe since the 1970s, both in new buildings and in retrofitting. The popularity of this technology grew due to its advantages regarding other techniques of insulation. ETICS guarantees the reduction of the thermal bridges and greater thermal comfort due to the preservation of interior thermal inertia, providing a finished appearance similar to the traditional rendering. From the construction point of view, ETICS allows thinner exterior walls and increases the façades’ durability. To the pointed advantages, it must be added with three aspects that are very relevant in the construction industry: low cost, ease of application and possibility of installation without disturbing the building’s dwellers, which is particularly important in refurbishment.